Exploring East End Waters: A Natural History and Paddling Guide (English Edition) de Mike Bottini está disponible para descargar en formato PDF y EPUB. Aquí puedes acceder a millones de libros. Todos los libros disponibles para leer en línea y descargar sin necesidad de pagar más. 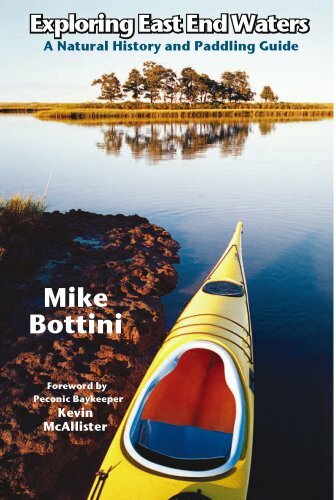 The most comprehensive guide to kayaking and canoeing on the East End of Long Island, Mike Bottini’s long-awaited Exploring East End Waters is based on his award-winning column in The Southampton Press. From the Peconic River to Block Island Sound Mike covers the extraordinary variety of East End paddling areas with a veteran’s eye for details and a professional sense of the natural history of the area. Consider the range of possibilities: fresh-water river and ponds, tidal creeks, salt-water ponds, bays, and estuaries, and—for the adventurous—sound and ocean. Where else will you find such a variety of paddling waters? No wonder the East End has been cited as “one of the last great places” by The Nature Conservancy. As a leading ecologist for The Group for the South Fork, Bottini has come to know these waters and their ecosystems intimately over the last seventeen years. Now he shares his knowledge with the rest of us. Author of the best-selling Trail Guide to the South Fork, Mike Bottini brings a unique naturalist’s perspective to this task. Exploring East End Waters not only provides the keys to an exhilarating set of more than 30 paddling trips—it is also infused with a savvy knowledge of the natural history of the area. It will open your eyes to the wonders of the complex ecology of the East End. Mike Bottini is a veteran naturalist, writer, and environmental consultant. After completing graduate studies in wildlife ecology at the University of British Columbia, Mike worked for fourteen years at the Group for the South Fork, a non-profit environmental advocacy organization. He is an award-winning columnist, a former adjunct professor at Southampton College, and continues to introduce people to the outdoors through his field naturalist classes, nature walks, and paddling trips.